StopTech's SportStop slotted or drilled rotors, StopTech stainless steel brake lines, street performance pads Rotors, lines and pads are for both front and rear. Components can also be purchased separately. 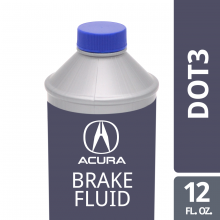 **FITS STOCK CALIPERS**. 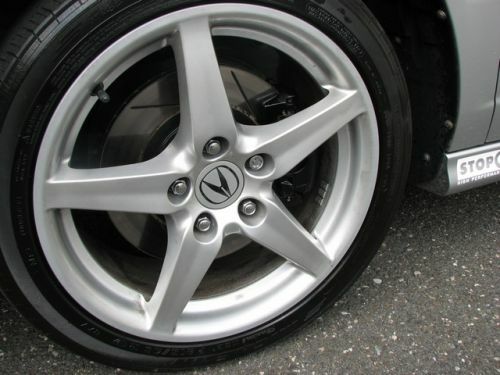 Slotted or drilled rotors prevent glazing of the pads, add bite and improve wet and dry braking performance. 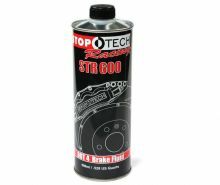 StopTech's SportStop rotors have a durable black coating on the non-swept areas of the rotor to prevent unsightly corrosion, and quality is assured as the rotors are manufactured to meet or exceed all OE specifications. 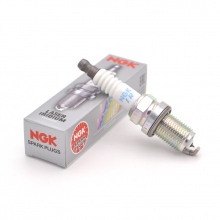 Stainless steel brake lines improve pedal feel and reduce the amount of time between applied pedal pressure and actual deceleration by preventing expansion, which stock rubber flex lines allow. 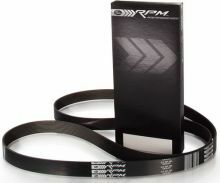 High performance street pads provide you with higher resistance to fade, higher maximum operating temperature, and better initial bite to allow consistent deep braking into corners. For extended track sessions, or if you are running out of heat capacity with your current stock sized upgrade and/or having to replace pads and rotors often, you may want to consider investing in the added heat capacity that a Big Brake Kit offers. 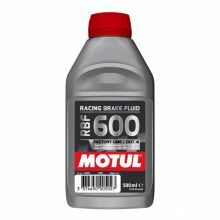 The kit doesnt come with brake fluid like in the picture. Other than that, they're good brakes. No appreciable difference over stock. No trouble to install if you know what you're doing. My kit came with Stoptech's Street Performance pads, Power Slot rotors, and Stoptech's brake lines. Before you even attempt this, get yourself an impact screwdriver. Drilling out the screws that hold the rotors in is no fun. The install was easy, just like any other brake job. The lines were easy as well. Just make sure to bleed the brakes well or you're negating your new steel lines. Definitely more grabby than stock. ABS engages way before I can feel any brake fade, and that's on slightly wet roads. The pads are totally silent, the rotors look great, and overall I'm very happy with this package. I don't know about how much dust the pads make because I haven't had them long enough, but the reviews floating around on the internet all seem to be positive. I purchased the kit off CRSX last month (when the price was about $100 cheaper =p)and installed it right away. I've been riding on them for several weeks now and I am very happy with them. I wouldn't say they are substantially better than stock but they definitely have increased the bite of the brakes and the brake effort feels a lot more linear and confident. I had been having problems with my stock rotors warping (had to resurface twice in a relatively short period of time) so I am happy with the improvement. The slotted rotors also add a nice touch aesthetically and match perfectly with my black calipers. 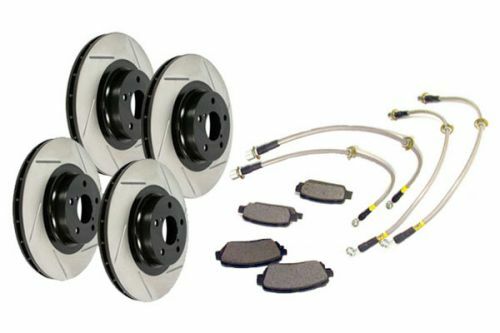 I'd say if your rotors are pooping out and you are in need of replacements, definitely consider getting this kit. I think it has very good value for all that you get with it.